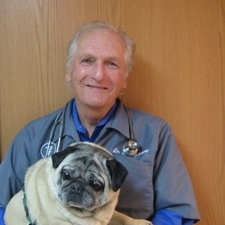 Dr. Alan Schwartz has been an active veterinary practitioner for over 40 years. His job is truly a labor of love. From interactions that he has with pet owners to taking adorable pictures of their pets, Dr. Schwartz’s love for animals is truly infectious. He is always searching for ways he can provide joy to his patients and believes that listening is an art. As he travels, he is never seen without his adorable pugs, Dumbledore and Consuela, who are always by his side to provide a kiss and a gentle nudge. Dr. S is always willing to do whatever it takes to take care of your pet! Dr. Schwartz did his undergraduate work at Cornell University, where he graduated from Cornell University College of Veterinary Medicine with Phi Zeta honors. His special interests are surgery, feline geriatric medicine, and holistic and natural medicine. Rich is our in-house animal behaviorist and consumate pet grooming specialist. He has been studying canine and feline behavior for over 45 years. As a young child his companion cats and dogs were a great part of his life. Rich is proud to offer his unique insights to our clients concerning the special bond we all share with our companion pets. As well as taking on individual behavior issues in our practice and directing our in-house grooming salon, Rich runs our puppy classes which we have on a regular basis at our office.